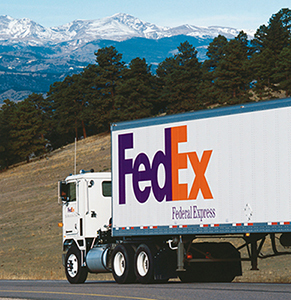 For over forty years Federal Express has led the industry it pioneered. Over this period, the company has met some serious challenges to its market leadership. This entry will discuss four such challenges occurring between 1992 and 2000, a period of immense change for both the company and its industry. Since inventing the express shipping business in 1973, Federal Express had come to face by the end of the 80s increasing challenges to its leadership in both domestic and international markets. A downturn in the economy, higher fuel prices and mounting costs associated with the company’s international expansion had placed significant pressure on the bottom line. Further, encroachment came from the proliferation of electronic messaging tools and from a growing number of increasingly sophisticated competitors. By 1990, Federal Express senior management had come to recognize that maintaining market leadership in the 90s would require better communication of both the Federal Express core brand positioning and the superior service attributes that differentiated the company in the marketplace. The critical factor facing Federal Express was change, both within the company and in the industry itself. When Federal Express began operations in 1973, the industry was one-dimensional: one company (Federal Express), one market (the U.S.), one product (the overnight letter) and one delivery time (next morning). As the company evolved, Federal Express came to introduce economical two- and three-day services. Delivery options grew beyond letters and documents to include packages and freight. Ultimately, service scope expanded to 185 countries. Over time, competitors UPS, DHL, Airborne Express and others entered the market. By 1992, the public had come to perceive all the players as offering ostensively the same services. An industry once the exclusive domain of Federal Express was now a fiercely competitive arena increasingly viewed by the public as a parity market. When the players are seen to offer the “same thing,” customer choice invariably defaults to price. The common perception was that Federal Express was the “most expensive” carrier and, as a result, was beginning to lose market share. Landor Associates had identified some serious communication issues: many consumers believed Federal Express did not handle large packages or freight; many thought the company operated only in North America; while others took lower priority shipments to competitors, unaware that Federal Express offered economical delayed-shipping alternatives. This lack of awareness translated directly to lost business opportunities. A yearlong global research study revealed, among other critical issues, that the name “Federal Express” was anachronistic: “Federal” had come to be associated with bureaucracy and slowness while “Express” had become diluted with over 12,000 companies in the U.S. alone having “express” as part of their names. On October 14, 1993 Federal Express approved Landor’s formal recommendations to build the core brand as “FedEx,” and to revitalize the company’s corporate identity. As a general rule, a corporate identity program is normally excellent value for the money. For less than the price of, say, a 30-second spot during halftime of the Super Bowl, a well-planned identity system can make consistent, meaningful, coordinated and permanent impact upon all of a major company’s activities. The development of the FedEx logo has been well documented. But what is less well known is the contribution of the FedEx identity implementation program to improving operational efficiency company-wide. The new bold and simplified identity has helped improve fuel efficiency for over 600 FedEx aircraft. In vehicle identification the new identity has reduced the amount of vinyl material per vehicle by as much as 75 percent, reducing down time and labor costs commensurately. By eliminating previously massive amounts of inks from stationery and packaging, the new FedEx design has greatly reduced the company’s printing costs and annually saves the company thousands of dollars. The Federal Express primary revenue documents—especially the ever-ubiquitous domestic and international air waybills—were examined for look and content then streamlined to reflect both better customer service and to better obviate the possibility of customer errors. FedEx stands apart from most companies by the fact that it clearly understood the value of committing significant resources in speeding the image revitalization process. The company might have elected to amortize costs and minimize dislocation by phasing in new identity materials in accordance with normal replenishment cycles that can take up to five years for a company of similar size and scope. FedEx largely completed the program in less than three, believing that advantages of a quick, impactful exposure of the new identity would more than offset the higher costs of an accelerated effort. Let’s now skip to October 1997 and Challenge Two. FedEx’s parent, Federal Express Corporation, acquired Caliber Systems. In the process, Federal Express created a holding company, “FDX Corporation” named after the Federal Express stock exchange ticker name. This holding company added to its FedEx express service the capabilities of RPS (ground/non-express), Viking Freight (less-than-truckload freight), Roberts Express (expedited) and Caliber Logistics. The logic was sound: the alliance would enhance Federal Express’ position as the world leader in transportation and supply chain management by offering customers a more complete portfolio of distribution solutions than its competitors, chief among them, UPS.For many years, UPS had owned some 80% of the standard parcel category. Without a heretofore-significant challenge in this area, UPS had been able to channel some of its significant profits into mounting a greater threat to FedEx in the air express market where FedEx had traditionally been dominant. The acquisition of RPS handed Federal Express an instant ground-service infrastructure that might have taken years for the company to build on its own. Now, finally, UPS, too, would have to wage war on two fronts. However, in the rush to close the Caliber acquisition, Federal Express chose the most expedient (and, at the time, only) course for naming the holding company, and defaulted to its Federal Express ticker name without due consideration of the ramifications the name “FDX” would have upon its business units. Hence, Challenge Three. Landor advised the new FDX to research among its acquired operating units what they each believed would be the impact of retiring their respective brand names for “FDX.” The business units were leery of adopting the name “FDX.” For example, from RPS we heard, “We’ve spent a lot of time building the RPS brand. If FDX is going to eliminate ‘RPS’ it’s got to back the name FDX in a really big way.” We heard also, “FDX right now is nothing. The FedEx connection is everything.” These opinions were largely shared by the other Caliber acquisitions, as well. Landor advised FDX to change its name to FedEx Corporation if the company could find a way to retain its assiduously protected exemption from collective bargaining under the Railway Labor Act (Federal Express—now FedEx Express—is exempted by virtue of being classified an airline and also an express company). In this matter, it should be noted that UPS has long argued that with both ground services and non-express shipping (especially now with RPS), FedEx should play by the same rules as UPS. One can imagine that UPS would enjoy FedEx suffering a crippling company-wide strike as befell UPS in 1997. As we know, FDX was eventually changed to FedEx Corporation by virtue of its several companies “operating independently while competing collectively.” And along came the colorful array of FedEx business units you see today. In sum, investing in building brand awareness for FDX was cash better served in building infrastructure for the future. First, while the cumulative weight of the nation’s economic output had barely changed since the end of World War II, its value had increased fivefold. * The high-tech and high-value sector had fostered an economic boon for the transportation industry, requiring fast, time-certain delivery of shipments with high value per pound (computers, mobile phones and the like). Second, globalization; the New Economy was also a global economy and the air express industry was, by its very nature, a leading facilitator of transcontinental trade. Third, fast-cycle logistics; as the trend in corporate America to cut costs through sophisticated supply chain management continued to grow, third-party contract logistics leader FedEx Corporation stood to profit—the company believing information would eventually replace inventory. And fourth, e-commerce; as e-commerce stood to become a powerful force for business-to-consumer and business-to-business transactions, FedEx would be uniquely positioned to change the way the world works. In conclusion, Federal Express met and overcame four significant threats to its industry leadership: in 1992, change both within the company and in an increasingly competitive industry; in 1998, the continuing threat of a UPS transportation powerhouse required Federal Express to acquire Caliber Systems in order to better compete; research in 1999 determined that building brand awareness of the unfamiliar name “FDX” would be cost-prohibitive and counter-productive to building a multi-faceted infrastructure; and, finally, FedEx Corporation’s ability to thrive in the twenty-first century would require seizing the opportunities of significant trends in an evolving high-tech, high-speed global economy. Having identified and solved these four challenges has helped FedEx maintain industry leadership today. * Data courtesy of FedEx Corporation.